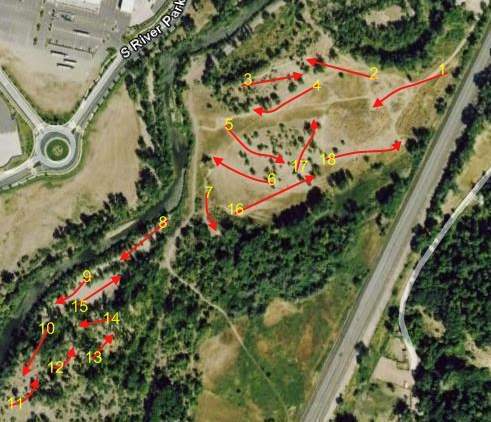 Natural course - open meadow with trees, bushes and the Weber River. Expanded to 13 holes in 2005, 18 holes in 2006, then 27 holes and all homemade baskets replaced in 2010. I-15; Riverdale exit (exit 339, 35 miles north of Salt Lake City). East on Riverdale Rd. 2 miles to a right on 700 west (last road before bridge). Go 250', turn left and follow road past city office building to dead end. 1st tee is east of parking lot. The best part about this course is that it's challenging in both hole length and obstructions. It could be better marked as the paths criss cross a bike path through the brush/woods. Also the baskets don't have numbers on them so we inadvertently shot at adjacent baskets for other holes. Played the 18 base holes and it took about 2 hrs due to looking for baskets and discs. It was still super fun and I'd do it again if in the area. Like playing here when I have time. Nice mix of open/technical and long/short. Need an updated course layout for holes 19-27. Signage could be improved. Appreciate the guys who are maintaining the course. Thanks! This is a great course for all skill levels. I am a beginner and can par some holes easily but will triple bogey on others. It has a good variety of foliage; trees, grass, weeds, gravel, and of course the river. The tee boxes are in good shape and is very well marked. All of the baskets are very nice and are functionally sound. Unfortunately, some of the weeds get waist high and you will most likely wind up getting fox-tails stuck in your shoes, which hurts. One negative part of the river being so close is that it's rather easy to lose your disc with an off throw on a few of the holes. All in all this is a very fun course that has a lot of tournaments. 18 holes sure is a plus too. This course is designed for golfers at all skill levels. Beginner, intermediate and advance tees are present on all 18 holes. While the course is not well defined---especially making the transition from hole 7 to hole 8, there are a myriad of people on the course to guide you along. What I love about this course is the balance between technical and long shots for the course. One hole allows you to open up and throw as hard as you want, while the next requires meandering through trees. In addition, the course is very large and there is very little, if any, overlap on holes making wait times minimal. 1. The rubber mats for the tees are mainly on the intermediate and advanced tees. There are no pads for the beginners, and the advanced pads are short. 2. There are very few hazards, but in the summer, some parts are pretty heavily wooded and if you are not a consistent thrower, you should have a spotter present for your discs. 3. In addition, there is a river running through the course, which can eat your discs if you are a wild thrower. Also, if it is windy/breezy or even looks like wind in the Ogden area, plan on loads of wind on the front 9. 4. One last thing, the back nine has its fair share of poison oak, just beware of where you are reaching when your disc flys into a bush. Overall, this is one of my favorite courses in Utah, it is a lot of fun, and you can even play it in the winter.